Last summer, it wasn’t safe to drink the water in Toledo, thanks to a giant algae bloom. Now, it’s not safe for the people of Flint to drink the water because when the “Emergency Manager” for the bankrupt city decided to switch water supplies- the acidic river water flushed the calcification in the lead pipes away- and the water is now contaminated with lead. Well, Dayton, knock on wood, has excellent water. And while we still have plenty of lead pipes for distribution, our hard well water, still deposits plenty of calcification to line and protect us. Our water is even softened with a huge lime kiln and has our blue lagoon off Route 4 to store our lime for keeping our water from tasting like nasty well water. A Woosh Station outside- which isn’t possible, because current system isn’t suitable for winter. So, you have to wonder what brings the Israeli tech start-up Woosh to Dayton to test their purified water stations to compete with bottled water. And, why do people in Dayton still buy so much bottled water- that often times isn’t as tasty as what comes out of our taps. That was my first question when I met with Itay Zamir and Dani Oren from Woosh Water when I met with them at Sinclair on Wednesday, Jan. 27. Their first answer was “people get innovation here” followed by “people care about the environment”- at least that’s what they’d been told. Why these guys were talking to me is another odd question. It seems the PR person who is handling them for the powers that be thinks this blog is well read- and I was the party responsible for bringing bike share to Dayton- and these guys love bike share. This is one of the first potential wins for the “Dayton Regional Trade Alliance” (DRITA) which has been shuffling politicians back and forth between Israel and Dayton- and we’ve got a few lobbyists on the payroll to try to sell Dayton as a manufacturing mecca, just prime to produce Israeli tech products for a much larger market. County Commissioner Dan Foley was there in 2013, along with then Dayton Assistant City Manager Shelley Dickstein when they first met with Woosh. 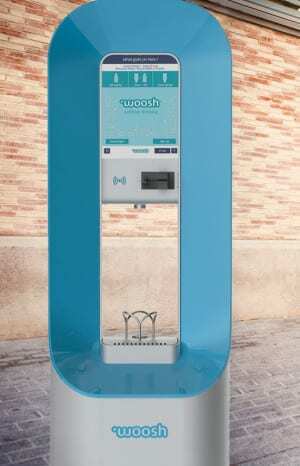 To explain Woosh- is pretty easy- it’s a glorified water fountain, that washes and “purifies” the bottle before filling it- with a credit card reader built in to take your money. The water is purified with O3- or Ozone, that’s made with water and electricity- and is the secret to cleaning your bottle. Could you use your own bottle and fill it from any old water fountain- sure- but, this water fountain has a few differences- the ozone treatment is one, the measured use replaceable filter (just like your refrigerator might have) and the wash step- for a price about half of what bottled water costs. The system has been tested in Tel Aviv- with some success. There was also some push back- when they first rolled it out with free water- there were complaints about the registration process requiring a credit card. The difference of course is here it freezes. They don’t have an outdoor machine ready yet. The machines cost around $20K each right now- but when they ramp up to mass production the price should fall. What’s missing right now is the business model. When pressed for how these are managed, who gets the money, and why you want to Woosh it- was all pretty vague. Right now, the three test stations in Sinclair generate money for Woosh. There is no payback to Sinclair for water, electricity or even rent for the floor space. Both Montgomery County and Dayton City Hall are planning on adding Woosh stations too- and according to the Dayton Daily- each org is kicking $25K over to Woosh to be in the pilot program. If this sounds a bit like Tom Sawyer charging his friends to do his work painting his fence you and I are in agreement. Of course, the payoff is the promise to build the Woosh in Dayton- for sale all over the U.S. This is what happens when politicians do business deals. That all being said- the Woosh guys are on a mission- to do away with the buying of bottled water. Ever looked at the bottle of water you bought at Sam’s Club or Kroger? Mother Jones did a story that a lot of the “premium brands” come from areas hit by drought. Many are just filtered tap water. The costs of bottled water add up; branding, bottling, transport, advertising- all for something we should already have- just open a tap, put it in the fridge- and voila. The fact that not only has bottled water use been growing at astronomical rates- but, that it supposedly outsells all soda sold on the Sinclair campus (the school wouldn’t give actual numbers). And that’s at $1.50 or so a bottle. Nice margin there if you can get it. There is also the issue of BPA in the plastic bottles that most bottled water comes in. All the “purity” of the water is put at risk by this chemical used in the bottle. The novelty of the Woosh system is the way you can buy it in bulk- and become a “member” – and use an RFID tag- or your Tartan card- to buy your water, instead of the single serve via cc option. The real killer cost here is the cc transaction processing cost- which is why giving a discount to larger purchases- or using the Tartan card is good for Woosh. They have also somewhat gamified their system- to track how much environmental benefit you are granting the world by Wooshing instead of hitting the bottle. Really- as long as people are willing to pay stupid amounts of money for bottled water- Woosh makes sense. I’m not really sure why the genius innovators in Dayton haven’t started selling our tap water bottled instead of handing money over to Woosh- but we could still do both. It sure seems smarter to ship Dayton’s wonderful water to Flint than to allow Pepsi, Coke & Nestle to ship their hoity-toity water from drought zones. Or better yet- start mass producing Woosh stations right now- and sell them to Flint, as a cheaper solution than having the National Guard handing out free bottled water daily. If someone from DRITA was smart enough to get it in writing that they’d be produced here- it shouldn’t be too hard to find demand for a whole bunch of these Woosh stations right now in Flint. The guys from Woosh aren’t monogamous to Dayton, apparently they’ve been having a dalliance with the city of Miami Beach- to install a “Smart Water Stations Network” in Miami Beach- they signed an agreement back in March, 2015. Let’s hope that Shelley Dickstein remembered to get this manufacturing contract in writing this time- unlike her Wayne Avenue Kroger deal. The Woosh system deploys with three stations at Sinclair on Monday, Feb. 1, 2016. One will be outside the Tartan marketplace, another at the Main St. Cafe and the third at the Sinclair end of the parking garage walkway in Building 14.